For Showcase I wanted to choose a picture taken during my current staff position at the Walsall Advertiser. 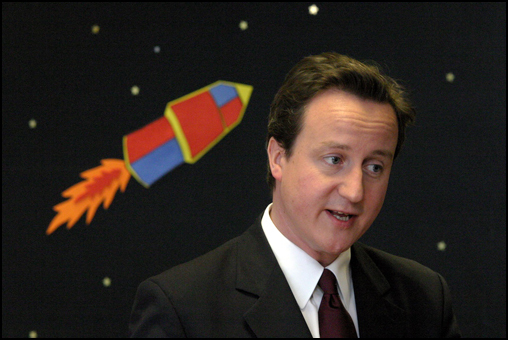 This picture was taken during a visit by Tory leader David Cameron to a primary school in Walsall, in April 2008. The official photo-call had already taken place, in a different classroom in the school. As I was about to leave, I noticed that reporters from the local radio and newspapers were invited to interview the politician in another room. It was when I noticed the colourful space scene decorating the wall, that I decided to stick around for a little longer. The picture was used on the front of that week’s edition. Jonathan Stokes has been a professional photographer since graduating from a Fine Art degree in 2002. He began by working in a family portrait studio and got his first newspaper job at the Shropshire Star in 2005. In November 2007 Jonathan moved back to his hometown in Birmingham and began working as a staff photographer for Central Independent Newspapers, where he works mostly on the Great Barr Observer and the Walsall Advertiser and sees this as being at the beginning of an exiting career! Photographer since 2002, EPUK member since 2008.